Is Santa Cruz worth a visit? We would definitely say yes. 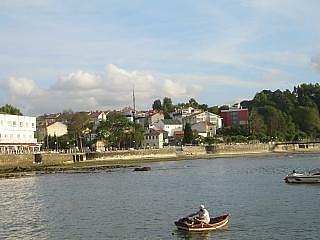 If you are near A Coruna and you like the sound of the place, and the impression that the photo's leave, Santa Cruz island and castle are worth seeing. It is certainly worth the 15 minutes each way to get there (if you don't get lost as we did), and it is also on the coastal road between A Coruna and neighbouring Ferrol, so it could act as a stop off point if you plan to visit both cities. At this point there is little more to be said about Santa Cruz, but I will give you a couple more photographs of what you can expect to see. Above, the town of Santa Cruz, which has at least one hotel and a few bars. 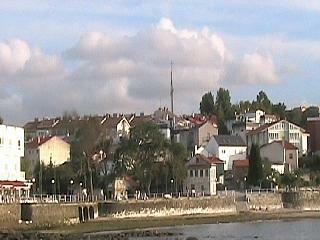 Above, the town of Santa Cruz, as seen from a position on the old harbour as it extends around the bay. 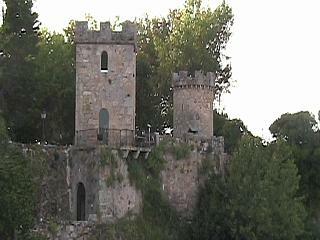 And finally below, a close up shot of the two main towers of Santa Cruz castle. The main fort building would be to the right of this picture and the walls extend all the way around the island. Santa Cruz web site - the url for the site is actually about the connected university and its research and therefore I have chosen not to included it.